The term WHOIS is a query and response protocol used to find information on domain names, IP addresses, domain hosts, and networks. This is publicly accessible information. This tool is only available for a domain that has been registered through (mt) Media Temple. For more information on registering a new domain, please see: How do I register a new domain? Watch this video to learn how to edit WHOIS contact information. From the Overview page or Domains tab, select the domain you want to edit. Click the Edit WHOIS Contact Info icon. 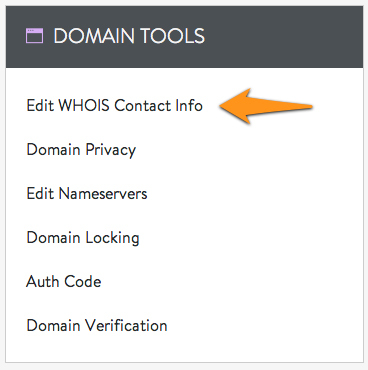 Click the modify button for the contact to update your WHOIS information. Complete the form and click the save button to save your edits.